Home Eventing News Here we go!! We fly out on Sunday! 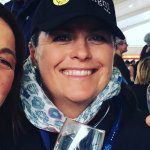 Before the team of Lindsey “Nairny” Constable, Prue Barrett and myself settle in for the long flight, we got together for our last chat before we go LIVE at Tryon. The “Here we Go” show is listen live this afternoon, Friday 5.30pm AEST. If you miss it live click on the INTERVIEWS button for all the Pre WEG Shows. If you’re not able to LISTEN LIVE to the shows from Tryon WEG find the replays via the PODCAST option on the app. Here’s our LIVE broadcast times. Wednesday 12th the first horse inspection (at this stage I hope to confirm this, look for posts either on Instagram or follow us on our Sit Tight Radio facebook page). Thursday 13th first day of Dressage. Friday 14th second day of Dressage. Saturday 15th Cross Country Day! Sunday 16th Final Horse Inspection and Show Jumping phase. During all our broadcasts we will bring you insights into the cross country course before Saturday. 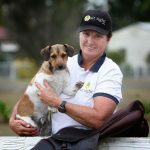 Both Prue and our new team member Rebel Morrow will be out getting in amongst the action, catching up with all the inside stories about how the event is unfolding. Keep your ears pricked for fun filled days of “word of the day” which could be cringe worthy! Nairny has promised some star spotting opportunities, #moreawkwardmoments! 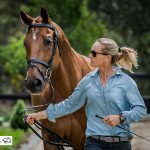 Thanks to the major broadcast sponsor Kelvin Grove Equestrian check out all the fabulous range and be listening to our shows for the coupon. Use for it a 10% discount on the Kelvin Grove range. (not from the Butet range). Thanks Mario, Anne and of course Gabi Kuna. Team Tinney has come on board to support the score board updates, thanks Karen and Stuart. Tamworth Horse Transport is a loyal supporter of Sit Tight Radio so please if you need your treasured horse moved with the best of care contact Michael or Sharmayne. Thanks to Anne for all of your help with my broken-ness and generally a great mate, here’s the Hawkesbury Chiropractic Centre link. and finally Sandhills Horses, your support has made the trip with Prue possible, thanks Craig and family. 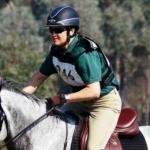 Including all the girls that will no doubt be tuning in and maybe not riding quite as many horses if Prue was home!! The WEG package which was available through the website will not be available after today’s broadcast. If you haven’t purchased the package the in app purchase option of 1 event is available. Android devices through Google play or iphones through itunes.